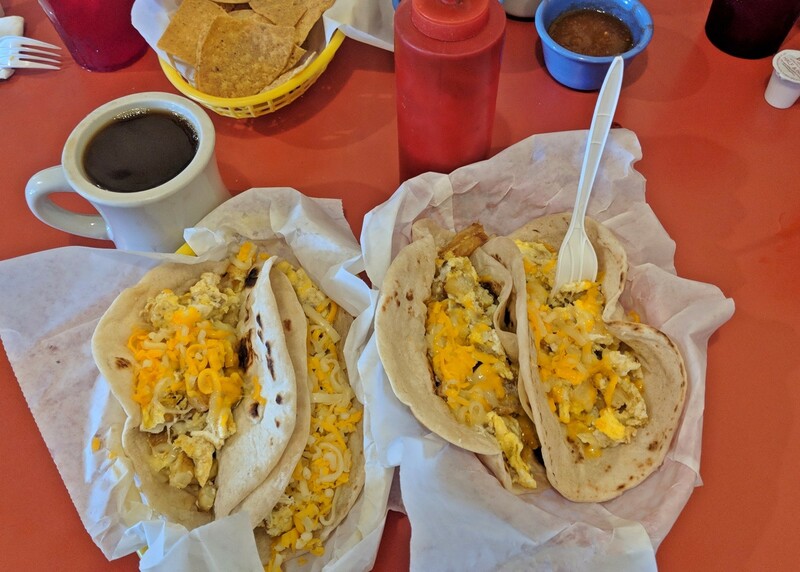 The breakfast taco is a ubiquitous representation of Tex-Mex culture from Orange to El Paso — despite our Austin neighbors claiming that they invented it. Regardless of its origin, the combination of fluffy scrambled eggs, a smear of refried beans, chunks of fried potatoes and maybe some bacon or chorizo wrapped in a warm tortilla is the perfect union of rancher and ranchero cultures, and a hallmark Tex-Mex dish. Houston Food Finder set out to find the best variations on the legendary breakfast taco in the greater Houston area. We scoured the east end down to Rosenberg and back around to Pearland for a cross section of local tastes. As a strict rule, out-of-town chains were not considered which means Tacodeli and Torchy’s Tacos, however tasty, didn’t make the cut this time. A dish as prevalent as breakfast tacos has dozens, if not hundreds, of contenders among the city’s many neighborhoods and sprawling suburbs. As such, this list is not intended to be exhaustive. 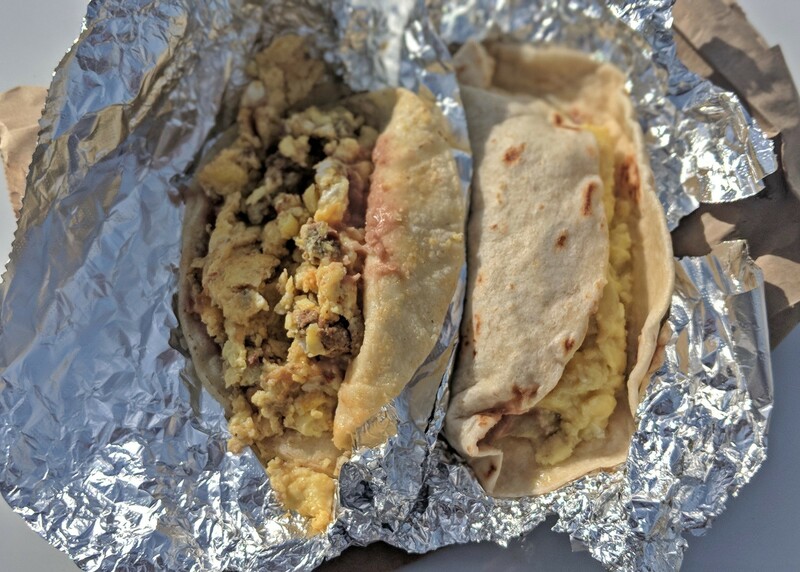 In fact, there’s a solid chance that the best breakfast taco in Texas is served out of a truck with no name or outside of an obscure neighborhood bar. With that in mind, if our collection omits your favorite, please let us know in the comments. Brothers Taco House, 1604 Emancipation: We begin our journey on Houston’s east side. In the heart of Third Ward, on the storied Emancipation Avenue, you will find an unassuming little taco shack with a curiously long line. Brothers Taco House is an aging institution in a neighborhood plagued by gentrification and rising property values. The family run taqueria is famous for one thing: breakfast. Brothers Taco House boasts a perpetual line out the door. Would-be diners need not worry, however, as the line moves surprisingly fast. A 20-person queue can take no more than 10 minutes to clear thanks to Brother’s assembly-style ordering counter. Quality tortillas are an obvious prerequisite for making this list and Brothers aces the test with flying colors. Soft, warm flour tortillas hug eggs, potatoes, bacon, chorizo and barbacoa in their doughy arms. Salsa-hungry diners beware — the bold salsas at this taco shack are nothing to play with, so garnish your taco at your own risk. 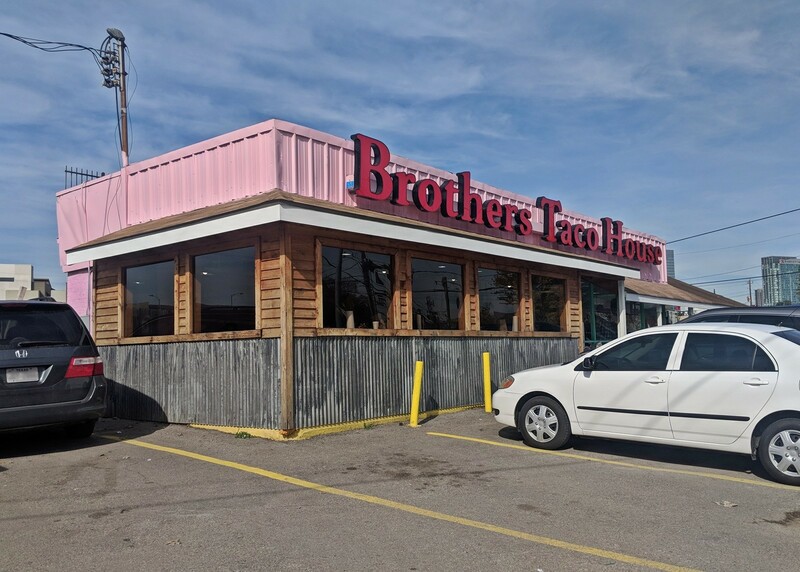 Brothers Taco House is open Mondays through Fridays from 5 a.m. to 3 p.m., Saturdays from 6 a.m. to 1 p.m. and Sundays from 7 a.m. to 1 p.m.
La Guadalupana Bakery & Cafe, 2019 Dunlavy: How does a mom and pop hole-in-the-wall with a tiny dining room and plastic patio chairs stay in business in the heart of Montrose, despite the area’s exorbitant commercial rents? It starts with a solid reputation as one of the city’s best Mexican restaurants, for one. It also has a killer breakfast taco. The breakfast taco menu here is limited compared to some of the other places on this list, but what it does have makes an impression. Tortilla-wrapped breakfasts are available in one of three ways: home style with potato and sausage, a la Mexicana with chorizo, onions, jalapeños and tomatoes, or especial with chorizo, onions and bell peppers. Each includes scrambled eggs and a thick, doughy housemade flour tortilla. La Guadalupana is an interesting case study in the cultural acceptance of the breakfast taco across both Tex-Mex and Mex-Mex cuisines. This is a traditional, family-run Mexican bakery and cafe, known primarily for its baked goods and authentic interior cuisine. 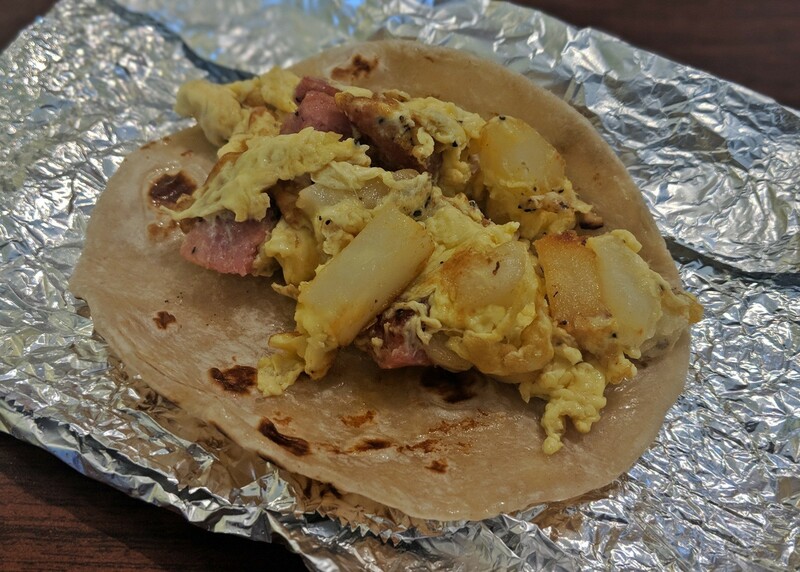 The family’s embrace of the breakfast taco is a testimony to the transcendence of this ultimately Texan dish. 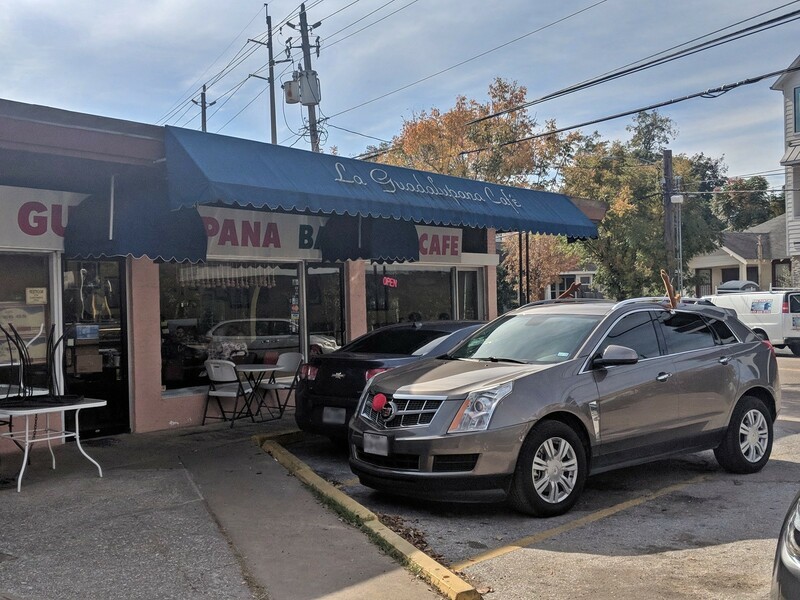 La Guadalupana is open daily from 7 a.m. to 3 p.m.
Luna y Sol, 2808 Milam: Yet another of Houston’s revered Mexican kitchens is also home to some of the city’s most outstanding breakfast tacos. Luna y Sol is famous for award-winning traditional tacos like the chicharron, al pastor and picadillo. It also offers our favorite Tejano breakfast all day long. 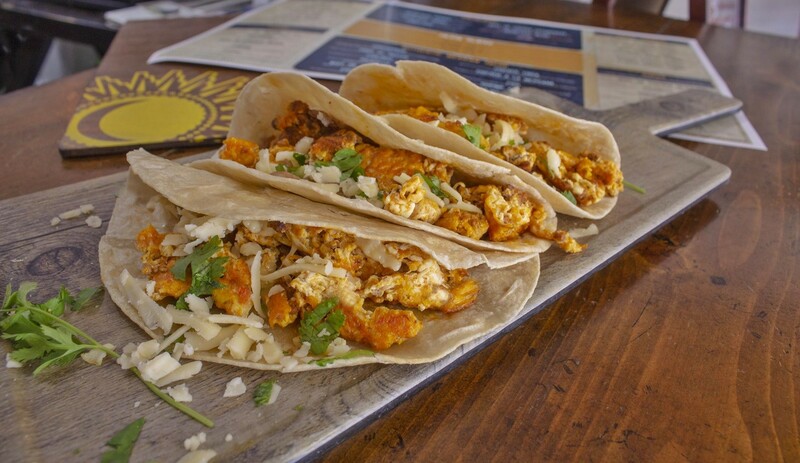 The breakfast tacos at Luna y Sol are famous for their high quality and fresh ingredients. Though (technically) Tex-Mex, the combination of flour tortillas imported from Mexico, quality chorizo and meats, fresh cilantro and cooked-to-order eggs makes these tacos lean heavy on the Mex. On the basis of freshness, texture and flavor the breakfast tacos at Luna y Sol are swinging in the heavy weight division. Thanks to an extensive menu of high quality authentic Mexican food at Luna, they may well be the most underrated tacos on our list as well. Luna y Sol is open Tuesdays through Thursdays from 11 a.m. to 8 p.m., Fridays and Saturdays from 10 a.m. to 9 p.m. and Sundays from 10 a.m. to 3 p.m. It is closed on Mondays. Papa Mex, 1008 Herndon: Rosenberg might seem like a hike for some Inner-Loopers, but these tacos are worth the drive. Papa Mex is a well-loved Tex-Mex joint and an iconic classic in this small Texas town. The family owned and operated cafe has been in business for decades serving the Richmond-Rosenberg community. Particular attractions include thick housemade flour tortillas and house salsa. The tortillas are pillowy soft and thick enough to soak up ounces of salsa while cuddling fistfuls of egg, potatoes and cheese with ease. These diner tacos also stand out for the perfect simplicity, which refrains from additions like refried beans and other sundry ingredients, thereby allowing shape and texture to take center stage. Unlike assembly line and cafeteria-style tacos that are more practical for busy commuters on the go, Papa Mex gives diners that exceptionally cozy feeling that comes from an endless cup of coffee, eggs and bacon straight off the skillet and a fresh-pressed tortilla. Papa Mex is open daily from 6 a.m. to 1:30 p.m.
Taqueria La Famosa, 2548 East Broadway in Pearland and 2800 West Main in League City: If Rosenberg is too far to drive, south Houston suburb Pearland offers a relatively close alternative for a taco excursion outside the 610 Loop — or go a bit further to its outpost in League City. The intimately sized Taqueria La Famosa is but a stone’s throw from Highway 35 heading south past Beltway 8. As the name implies, this local favorite is famous for breakfast plates, tacos and classic Tex-Mex dishes. Stellar housemade corn tortillas equal authenticity and fresh potatoes, eggs and bacon seal the deal. Simple done right is a beautiful thing. This is a bonafide Pearland must-try and is among the Houston area’s most underrated Tex-Mex kitchens. Taqueria La Famosa is open Mondays though Saturdays from 6 a.m. to 5 p.m. closed on Sundays. Laredo Taqueria, 915 Snover: At first glance, the iconic bright green taco shack on a corner in trendy Washington Heights may look out of place. The vintage building clashes with the encroaching modern architecture of townhouses and post-grad apartments. However, take a second look, because the line that wraps around the corner — even on a cold November morning — tells no lie. Like Brother’s Taco House, the line at Laredo moves quickly thanks to the assembly line ordering counter. With a slightly larger dining room than the former, this mom-and-pop shop can seat several parties but quick turn-arounds are encouraged. 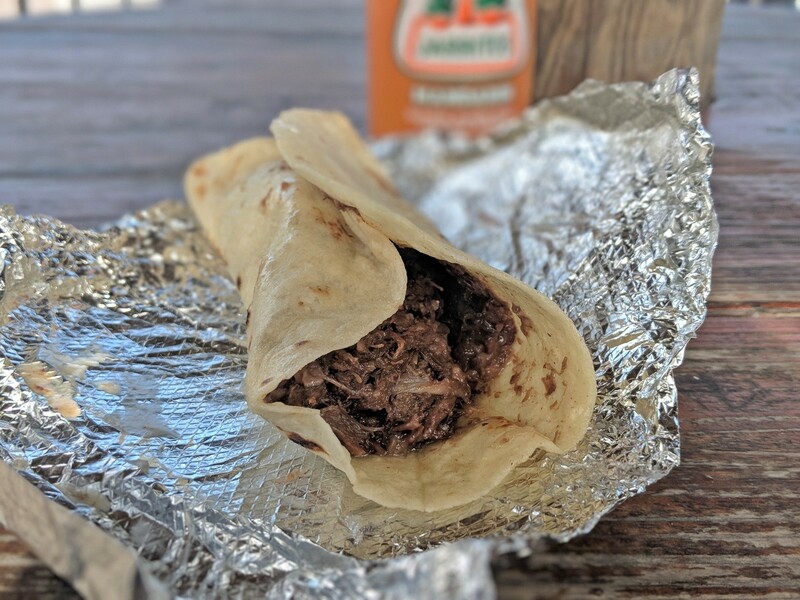 While the tortillas and breakfast tacos are of high quality and in even higher demand, it is the popular barbacoa that lands this neighborhood eatery a spot on our list. The tortillas are stuffed with barbacoa that is thoroughly seasoned, tender and greasy as all get out. These are a taste of authentic Mexican street food, despite the use of a Tex-Mex flour tortilla. They do not contain eggs or cheese, but are listed on the breakfast menu and available daily. So, despite our own loosely enforced rules, they make the cut. Laredo Taqueria is open Mondays through Saturdays from 6 a.m. to 6 p.m. It is closed on Sundays. 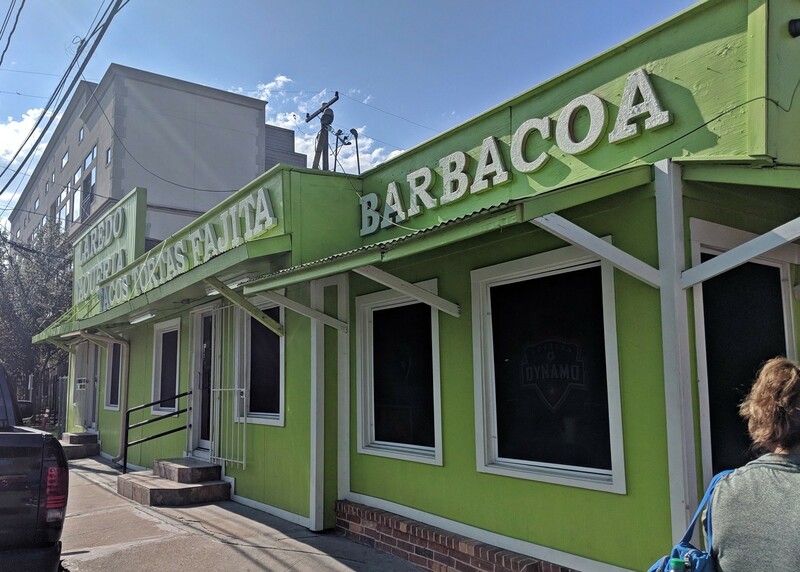 Villa Arcos, 3009 Navigation: Navigation Boulevard east of downtown between 59 North and North York Street is undoubtedly the Tex-Mex mecca of Houston. This one-mile stretch of road is home to the Original Ninfa’s, El Tiempo, Alamo Tamales & Tacos, Merida Mexican Restaurant, Doña María and of course the legendary Villa Arcos. Despite teasing that it would be changing locations back in 2016, this family-owned restaurant has been serving their iconic breakfast tacos in the same location for 40 years. 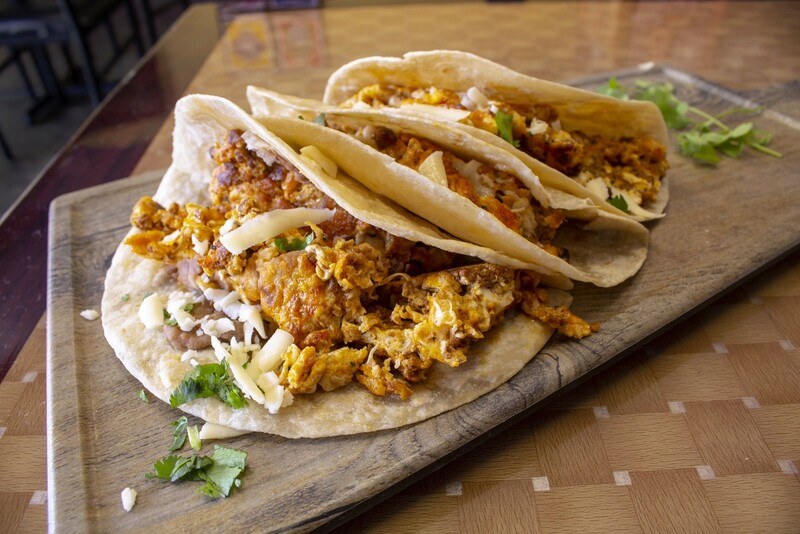 Most notable is the Bacon Super Taco with eggs, cheese, beans and thick slices of freshly cooked bacon that has been one of Houston’s favorite tacos since the 1960s. The historic Villa Arcos is perfect for a grab-and-go breakfast taco and is open Wednesdays through Saturdays from 6 a.m. to 1 p.m. and Sundays from 8 a.m. to 1 p.m.
El Rey Taqueria, 910 Shepherd: Although the intention of this list is to steer clear of restaurants serving quirky bastardizations of what is already a perfect thing, and focus on authenticity over #TacoTuesdays, there is one essential exception. No Houston best taco list would be complete without the addition of the delightful Cubano-Tex-Mex fusion that is El Rey Taqueria. El Rey is a Houston institution and built four locations in the greater metro area over nearly 20 years in business. Though the mini-chain is mostly known for ropa vieja, carnitas, and Cuban tacos during lunch and dinner, it also serves a few breakfast tacos that are well worth rerouting your morning commute to get. Most notable among these is the Cuban egg taco that is an early morning variation on the signature Cuban taco. It features eggs, black beans and fried plantains in a soft flour tortilla. The simple addition of black beans and plantains infuses mouthwatering Cuban flavor into a Tex-Mex standard, creating a three-way cuisine fusion that keeps cars wrapped around the drive-thru day after day. The flagship Shepherd location is open Mondays through Wednesdays from 7 a.m. to 12 a.m., Thursdays through Saturdays from 7 a.m. to 3 a.m. and Sundays from 8 a.m. to 10 p.m. Note that hours vary at other locations so check before visiting. I buy no less than 8 dozen breakfast tacos a week. I’ve found three really good taco shops in the Houston area. One, Chachos an authentic Mexican restaurant on Westheimer is open 24/7. 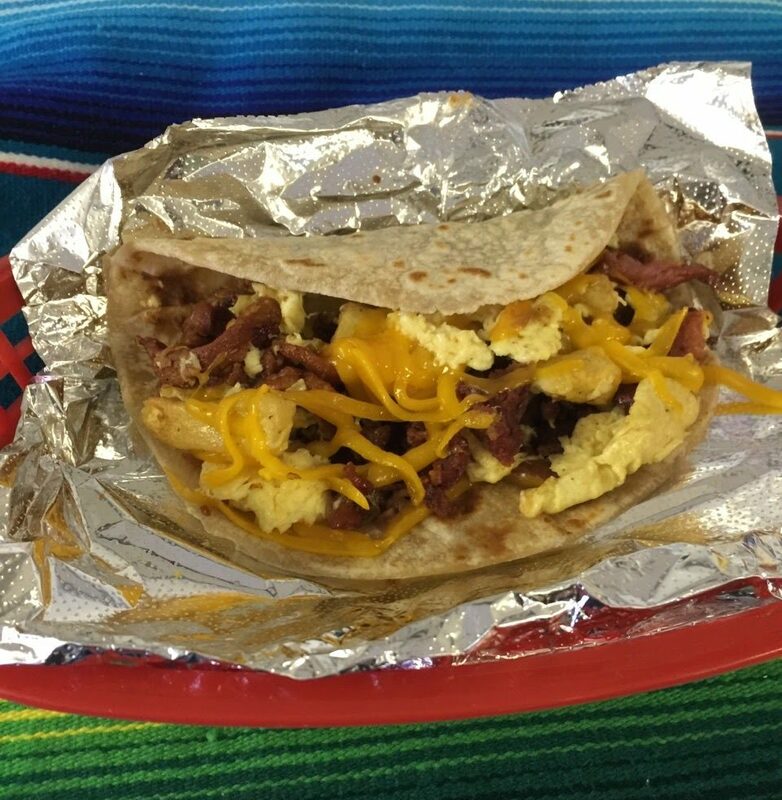 They have a booming breakfast taco business that’s always consistent. Two, Papa’s BBQ on Pierce St not to be overlooked, serves the largest breakfast tacos in the area, with large containers of salsa and pico de gallo.Three, Otto’s is another popular spot downtown Houston, Dallas St. They are also authentic and assembly line prepared. Johnny, is that Otto’s near Allen Center? If so, I’ve had the breakfast tacos many times! Vendors used to bring them to the office where I worked. Good stuff. That’s the one. Very popular.